If you own a stationery store, a business with a board of directors, or a book store, this stylish hardcover notebook is perfect for you. It contains two different sizes of sticky notes and a pad of brightly coloured adhesive sticky flags. Your logo on the front will speak of the thoughtfulness, class and style of your business with this unique promotional item. 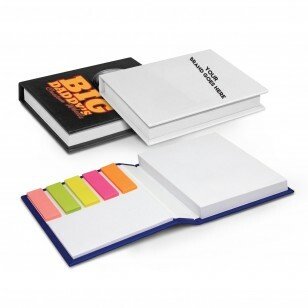 It is a great size to carry in your pocket or purse for easy access to jot down notes, mark pages in a book, or to write down important things not to forget. What an awesome promotional gift! We are a wholesale supplier, so we deal in bulk orders and ship Australia wide. Price excludes GST but does include 1 colour and 1 position logo placement. There will also be a $60.00 decoration set up fee applied to all orders. We have a standard two-week production time on this item, so contact us now if you have an upcoming event. Although, we can arrange shipping and delivery to your business address, or directly to the location of your next vendor event or trade show. For any further questions contact our dedicated customer service department.